Portable Folding Picnic Tables - Picnic Table Store-Commercial grade quality-lowest price. 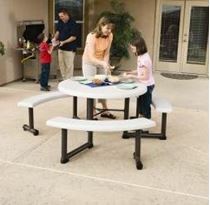 These flexible folding picnic tables have gained popularity over the last ten years. We offer these portable folding picnic tables with the caution that they are not as tough as our commercially rated tables for a permanent installation. However, for mobile uses these portable folding picnic tables are ideal for storage and moving. Folding picnic tables from Picnic Table Supplier have an almond or putty colored polyethylene tops and seats with 1 5/8" bronze colored metal legs that fold for convenient stacking and storing. This portable picnic table can conveniently be used inside or outside. Use this picnic table at a school or day care so children can play outside! We also have children's sized portable folding tables at a height that is accessible for them. Use one of these tables for a party so you can have an easy clean up. These tables are light weight making it convenient to move. 42" Folding Rectangular Children's Picnic Table, 25 lbs. 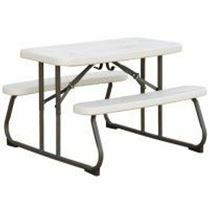 6 ft. Rectangular Folding Picnic Table, 76 lbs. 44" Round Folding Picnic Table, 85 lbs. Our portable folding picnic tables are the perfect solution for parties, schools, and day cares! The folding picnic tables have folding legs making them conveniently portable and stackable. One of these folding picnic tables would be perfect for a daycare because it can be moved inside or outside depending on where the children are playing.